Today’s been a bit unlike most Tuesdays at the Raspberry Pi Foundation. Today we’re the recipients of a very generous grant from Google Giving, which will provide 15,000 Raspberry Pi Model Bs for schoolkids around the UK. 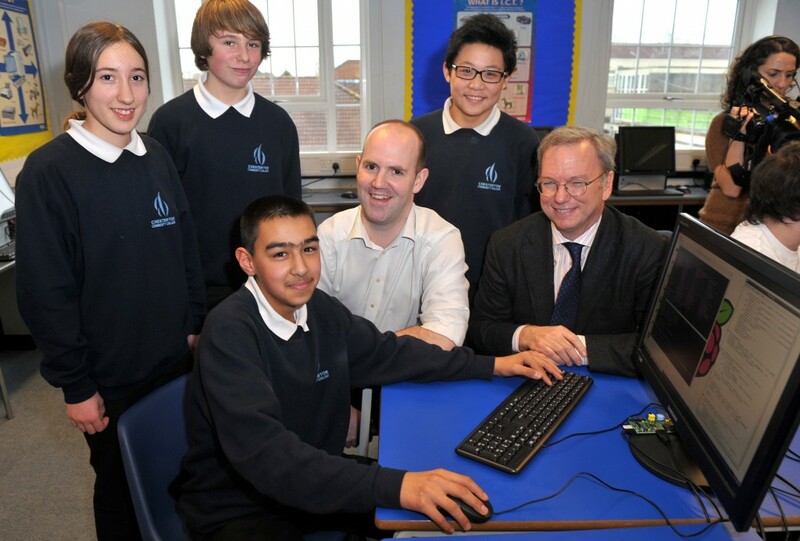 Google’s Executive Chairman, Eric Schmidt, has just been to visit Cambridge, and he and Eben have been teaching a classroom of local kids to code all morning. Lucky kids. We’re going to be working with Google and six UK educational partners to find the kids who we think will benefit from having their very own Raspberry Pi. CoderDojo, Code Club, Computing at Schools, Generating Genius, Teach First and OCR will each be helping us identify those kids, and will also be helping us work with them. You’ll already have seen the Raspberry Pi teaching materials from Computing at Schools; OCR will also be creating 15,000 free teaching and learning packs to go with the Raspberry Pis. We’re absolutely made up over the news; this is a brilliant way for us to find kids all over the country whose aptitude for computing can now be explored properly. We believe that access to tools is a fundamental necessity in finding out who you are and what you’re good at. We want those tools to be within everybody’s grasp, right from the start. The really good sign is that industry has a visible commitment now to trying to solve the problem of CS education in the UK. Grants like this show us that companies like Google aren’t prepared to wait for government or someone else to fix the problems we’re all discussing, but want to help tackle them themselves. We’re incredibly grateful for their help in something that we, like them, think is of vital importance. We think they deserve an enormous amount of credit for helping some of our future engineers and scientists find a way to a career they’re going to love. Kudos to Eric for putting his money where his mouth is after his speech last spring. I don’t think we could have ever got the momentum we needed to get going with Raspberry Pi without that speech. Wow! This is great! As a (reasonably) young Systems & Control Engineer in the UK, I am really very glad that the momentum is building, everyone needs more Engineers, Computer Scientists etc and it’s great that the Foundation is having such an impact. Is there Raspberry Pi giveaway in USA? This program’s just for the UK – we hope other companies will also get involved, though, in funding similar programs for their own countries. Interesting, given that Google is an american based muntinational company, at least according to wikipedia. Are schools elegable for this money, or just students? Our school *want* a class back of raspberry pi’s, but they do not have the funding (and with the IT budget shrinking, probably will never have funding). I’ll be explaining a bit more about this later on today in a separate post – but for now the intention is for this particular set of Pis to go to individual kids rather than schools (where they do, with the best will in the world, run the risk of ending up in cupboards), because we figure we can reach more people faster and more effectively this way. Great news that the donated Pis will go straight to students. Liz is absolutely right that they will end up going dusty in cupboards if you give them to staff. The staff are overwhelmed with work already. 2) Teaching material for after-school coding clubs. Ideally, some PDFs. One set for Scratch, another set for Python. 3) Bulk discount purchasing of HDMI->DVI dongles!!! 4) CRB check funding or some kind of arrangement for discounted/free CRB checks. Because, with the best will in the world, a bunch of portly beardy-weirdy real ale Linux geeks looking to be left alone with 30 shy kids in a school that is otherwise closed for the afternoon, once a week for a whole term… well, we’ll definitely need CRB checks. Dam. I knew I shouldn’t have taken a look at that site. Appears that my daughters school is looking for someone to run code club……. That’s great news!! Lucky kids indeed, learning to code with Eben & Eric! Must be scary to think they are giving away 1.5 times the foundation’s original self-funded budget for boards. Much more than that actually. These are $50 bundles, and there’s money in the budget to hire Clive and produce some teaching material too. Have you Pi guys (and ladies) thought of doing some kind of ‘Donate-a-Pi’ page where individuals can donate money to a fund which provides Pi’s to schools and other worthy groups/clubs? We need more people on board to administer that sort of thing than we have at the moment; we have considered it, but it’s a more complicated job than you’d imagine! We may do something similar in the future. Yes, I can imagine that it would take some setting up and administrating. Glad to hear that it’s been discussed though. It would be nice if we (the Pi community) could collectively do what Google just did albeit on a smaller scale. It would be awesome to get these into South African schools. (I’m a South African software developer with 3 Raspberry Pi’s). This is huge. Congratulations guys. No wonder Eben’s smiling. Congratulations to the UK students! ARE YOU READING THIS BILL GATES! If you don’t know what is a RPi, meet me at the next Teach-In event in Orlando, Fl! Bill does quite a lot for education* (and much more) so there is no need to yell at him. *Now if would just do this much to fix Windows the world would be much better. Don’t knock Bill, seeing as half of the Cambridge Computer Science department that helped to make the Pi was funded by the Bill and Melinda trust. They also kindly provided the building for the Cambridge Raspberry Jam and although normally competitors have been just as vocal as Google about Computer Science. [tongue in cheek] Now all they have to do is donate 15000 Gertboards as well. Gert from memory. Built gurt boards are 1200 for 30squid? Wow, one minute, Eric is touring North Korea, the next he’s donating Raspberry Pi’s. Is there no end to this man?! They’re keeping him very busy – when he left us he was going straight on to another event in Cambridge (with the university, I think), and I don’t believe that he’s anything like done with his day’s appearances and appointments yet! This initiative, in addition to their massive investment in expanding their UK headquarters to a new development in Kings Cross London (http://www.bbc.co.uk/news/uk-england-london-21074951), confirm that Google have a high level of interest in the UK as a hotbed for current and future talent in computer science. However, I do wonder whether the recent bad press about multinational companies tax affairs has been a contributing factor to Google’s further investment in the UK. If so, it’s certainly a step in the right direction, and one to be pleased about. Out of interest, is this shipping order going to tie up Farnell and RS for a few weeks? Not understanding how it could not slow things down by weeks or more when none of the suppliers ever show having inventory as is without a 15,000 order bulk. We’ve been setting aside units for a little while at a low rate, so it’s not like a 15,000 hit suddenly lands on one day. Incredible. This is wonderful news. Congratulations to Eben, Liz, the Raspberry Pi Foundation, and those students who are going to benefit from this. Fantastic news! Be interesting to see the plan for delivery! Google has done good with this! Which by reckoning means you can’t be far of 1million Pi’s Baked and Sold. I must say there seems to be quite a lot of momentum on this at the moment, I’m a STEM ambassador (http://www.stemnet.org.uk/) and visit schools from time to time to give talks about my subject (Computer Animation / games). Three of my local schools are going to be offering GCSE Computer Science next year and all were loving the Pi when I took it in for open days / talks. Way to go Google! How great for all those kids! Hope a link goes up for all the cool things they’ll make and do. Wow! Sounds awesome! Wish you could bring some to our school! Have a raspberry pi myself, and it is actually the best thing ever! Such a great little machine, and great fun to play with! What is the process to apply. I run a Code Club at a primary school and there are a couple of girls who really get it. Class of 12, 50/50 boys and girls. I am putting together a remote control car controlled by Scratch at the moment to bring in to show them that Scratch isn’t just about making a cat bounce around the screen. Arrange a Raspberry Jam and plan to run more. It’s very early days, so I don’t have much info to hand on how it’s being organised; but you can be sure you’ll read about it here first! Thanks. I’ll keep an eye out. I am proud to say that it is my daughter on the picture! great news… what would happen if google just put the raspberry pi up on their homepage for say 8 hours!!! Can home educated kids apply for these? Some of the partners (notably Coder Dojo) run programming classes which are decoupled from schools. Think “children of school age” as opposed to “school children” :) So yes, home education is certainly in our remit. Awesome, thanks Clive, Eben and Google. So how do we actually sign up for these? More details will follow once the dust settles! Does the UK giveaway cover Northern Ireland schools too? We’re in the UK but often forgotten about and we need future geeks NOW! It does. I know Coder Dojo are very active in NI and the Republic. Hearty agree – and we couldn’t have got as far as we have in that 12 months without your very specific help, Alan! In less than 12 months, the Raspberry Pi computer has galvanised a global community together into action with one common goal in mind; to inspire the digital creators of tomorrow. It has become a powerful catalyst, helping advance the activities of all who want to promote the enormous potential of computing in schools and in bringing about a much needed, radical upgrade to our ICT curriculum. This Google initiative will support teachers and children through a range of hands-on workshops and training to make these low cost computers even more accessible to all. I hope that people will still want to come to , since these create rich opportunities for children, families, teachers and industry all to come together in one space to learn in a totally different way than a classroom provides for. As a codeclub ” teacher” I am not sure how the RPI fits in. Will this initiative come with other hardware? The most exciting thing the RPI brings are the GPIO pins but I’d like some guidance and support on what to connect and teach. Other than that they are just another computer but with inappropriate video out for the environment (HDMI in schools). Also it would be great to see more advanced, even professional artwork to go with the CodeClub materials. Or even materials to give directly to teachers so they can deliver something similar to all the kids in their school? What am I saying? I think it is that these groups need and support more than a bulk order of hardware to distribute. Stephen, the Gertboard is specifically designed to teach I/O with the Raspberry-Pi. It comes with a 50-ish page manual how to do that which you can download for free. The Gertboard thing does look good, but is it suitable for 9-11 year olds? I’m not even sure I see how it improves over the built GPIO let alone explaining that to the kids. I’m thinking more “Mindstorms” and less soldering – there’s a place for the latter but it’s not necessarily alongside a course Scratch to get the kids into it all. nice going getting some RPis to coderdojo, I’ve been to a few of their sessions (as a padawan) and I can honestly say that I’ve learned a fair bit from them! They’re brilliant, aren’t they? We’re big fans of their approach. Just not sure how the boards will be distributed as I have not heard of any of the associated organisations operating in Scotland. Main Scottish mechanism would be through Education Scotland. We have a set of them here at CoderDojo Scotland, that we will be using throughout the CoderDojos across the country. Is Eben doing his overly attached girlfriend impression? Nah – that’s my job! “Schools are increasingly being used as marketing venues by companies promoting their own brands in return for teaching resources, books, sports equipment or computers,” said a National Union of Teachers representative. In a seperate incident, the computer lab was being rekitted with Apple Macs in the style of an Apple Store. I bet the school didn’t pay full price for them. And Apple has been doing the same for 25 years as well. Perhaps in the future history will teach that this is the time where it all gained momentum. Well done everybody. Me: “Okay, Eric, you crossed the creepy line for sure. It is really good to see Google funding the future computer programmers, scientists and engineers, bravo! We could probably find some funding to buy a large number of Raspberry Pi computers for France. However, without a change in the education system this would be a waste of money. Without the work of CAS et al. in the UK, Google would not be able to be such a blessing. I know were not GOOGLE and are only giving 12 RASPBERRY PI’s away, but at the WEA were going to be getting ADULT LEARNERS excited about COMPUTING again using the RASPBERRY PI – I will be deploying a two day INTRODUCTION workshop in NOTTINGHAM 11th & 25th Feb – 11am-4pm and then the material will be shared within the WEA for potential deployment at other WEA locations. Thats Eric Schmidt! That geek is freakin cool, he’s using Google tech to fight Mexico’s drug cartels. A geek persona straight out from a sci-fi hacker movie. Wow. Congratulations UK students! And this is a cool step, Google. I really *like* this new. Its good news thay are the more powerfull and useful model B’s! Well done Google and the foundation! Its great the foundation & its partners are putting governments past & present to shame, three decades on inaction put right in one mighty swoop. Great effort from Google! That is a huge head start for getting RasPis where they need to be. Are google now worthy of the “Friends of Pi” section? and can they have their arms twisted for a “best use of a PI” competition or even to host “PI great egg chase games”? I see Eric is wearing normal glasses and not the hi-tec google bluetooth ones….. Is this because PI’s dont have bluetooth…. i wonder? How would a school go about getting some of these Raspeberry Pi’s from Google? The short answer is that the donations will be handled via one of our partners (as Liz says in the post). We (and they) will be able to tell you more soon — it’s early days! It is curious that Google has taken so long to get around to contributing to computing education anywhere, let alone somewhere outside the U.S. Bill Gates has several computer science buildings named after him on campuses like Stanford, and that’s pretty much been his visible contribution to public education in the developed world (his foundation hasn’t had much of an impact in any meaningful way beyond a few poorly self-publicized secondary school pilot projects). I’m battling the traditional educational IT bureaucracy that has grown up around MS and Apple based systems, and I agree that distribution of Pi hardware alone isn’t going to be enough, especially if it were done through the normal IT channels. However, that’s how the funding troughs are lined up, and knocking over those non-round-bottomed rice bowls is going to take a major effort, especially given the direction that all budgets are heading, not just school IT budgets. Even with SillyCon Valley’s riches, the local Coder Dojo doesn’t know where its rent money is going to come from in the immediate future. 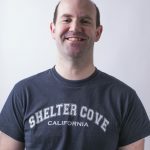 In surrounding agricultural areas (where half of California’s sixth-largest-in-the-world-if-it-were-a-country GDP is generated), there are no resources for anything like coder clubs beyond what little is available in schools (as a place to gather, if nothing else), since the lower economic portion of the population lives in plywood shacks. In any case, this is a welcome development and we can only hope for and encourage more activity like this everywhere. It needs to be matched with the other requisite hardware (e.g., displays, keyboards, pointing devices, etc. ), educational materials, and knowledgeable personnel, though. There’s extra money in the grant (we’d initially been asked not to discuss how much it was, but when a news site tried to work the sum out by multiplying $35 by 15000 and got a very wrong figure, we were given permission to talk about it: it’s a million dollars). That’s going to employ Clive; it’ll also provide materials (good quality, printed materials), support for teachers and for kids, and (I believe) peripherals. As for “traditional [IT] bureaucracy” – I’ve been really dismayed by the reaction of the UK’s largest teaching union, who made out that Google was only doing this to get Google products a foothold in schools, and that the effort we make is wasted. (It appears to be their job to react as negatively as possible to any effort anybody makes in their sector.) And it’s nonsense, obviously; see any Android, Chrome etc. on there? That sort of attitude’s as much of a problem as money, and it’s something we have to work on. I’m with Liz – the NUT spokeperson needs a short sharp slap to the back of the head, since they are obviously unaware of the massive Microsoft bias in the current ICT curriculum, which is massively more damaging in the very way they describe, than Google donating money and not asking for anything in return. At the same time this was happening I was at school meeting in SoCal. The school explained that the computers were effectively only for running tests and that there was no budget for buying more. The solution is that every parent will be asked to buy an iPad, and there is no educational discount. The school district explained that Apple is so popular that they don’t have to give a discount. For the price of one iPad I could buy a Raspberry Pi for a whole class. I applaud Google for what they have done, and wish California could show more love towards Raspberry Pi. Ian, if you can take command of the Southern Front, and I can take over here on the Northern Front, we can meet at the equivalent of the Appomattox Courthouse when the last non-Pi has surrendered. That would be somewhere around Bakersfield as a geo-population centroid for all of California. Then, we turn our attention Eastward until we revisit the actual Appomattox Courthouse. WOW! The smiles tell the story. Especially on Eben… what words cannot describe, is conveyed in an instant with that smile! Congratulations! cool! but how about here in the U.S.? I am starting to think about a “buy-one-donate-one” program for some schools here in the U.S. (specifically here in Minnesota). Something similar to the OLPC program (though the Rpi is gaining popularity much faster than OLPC could ever even imagine). I have plenty of children at our Y6 Computer Club who would love one, more Scratch. Well done, Google! I am a teacher at Faculty of Education (University of Vigo, Spain) in ICT and Education. I also work with several schools trying to improve the way teachers are using ICT in a inclusive and collaborative manner. One of my research topics is programming and also robots (Moway) in education (nursery and elementary schools) from an inclusive and participatory perspective, and I am wondering if you would be interested in introducing Raspberry in Spanish schools. Thank you! Liz, its just not the UK kids, its the world ! Just seen this on the web “A piece of the pi: Google offers $3.14159 in cash rewards to any hacker who can crack its Chrome operating system”…. I wonder if their donation has hit a chord? How can my pupils apply for one? Please tell me how.